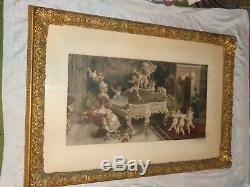 This is an old antique original late 19th Century or very early 1900s wonderful print of a French lady playing piano with dancing cherubs. I have had this print several times in the last 35 years but I have never had it in wood gesso frame this elaborate. The outstanding frame is 29" by 41" and print seen is 15" by 28 1/2". It has its old original matt and old dust cover. All I see to note is a small area of gesso loss on side. Also a tiny gesso chip on left side. The frames also has some craze lines in the gesso. The print outstanding with nice color and is in very good condition. All I see to note is a very light 1 1/2 diagonal scratch on her skirt the camera picked up but I never noticed. The inside of the glass has some very light dust that is not on the print and not worth me noting also. The print and frame weighs 24 pounds. The item "ANTIQUE VICTORIAN FRENCH LADY PIANO CHERUBS PRINT ORIGINAL ORNATE FRAME ESTATE" is in sale since Wednesday, May 23, 2018. This item is in the category "Art\Art Prints". The seller is "2die4s" and is located in Saint Joseph, Missouri.